It’s every fruit grower’s priority to keep his orchards safe. But sometimes you cannot avoid diseases like fire blight. Fire blight in pear orchards is extremely difficult to control as it spreads rapidly in the plant and the entire orchard. Today, regular inspections of fruit orchards, nurseries and other host plants of the bacterium Erwinia amylovora remain an important measure in a fire blight control strategy. But visual inspections are labor intensive, time consuming, and the human eye cannot see what a multispectral or hyperspectral sensor can capture. For this, the development of aerial and ground-based hyperspectral and multispectral imaging technology has been a major breakthrough. By measuring the spectrum of the reflectance of plants in visible (VIS) and near infrared (NIR) light, we are able to identify the primary disease locations and the areas of differing disease severity in the orchards. In combination with advanced methods of data analysis, these techniques are evaluated for targeted pest management programs in fruit orchard regions. Fruit growers have to be experts in crop production, soil management, orchard design, fertilization, but also in business management. Not always an easy task. For years it has been known that orchard uniformity is one of the key factors in producing high yields of quality fruit. 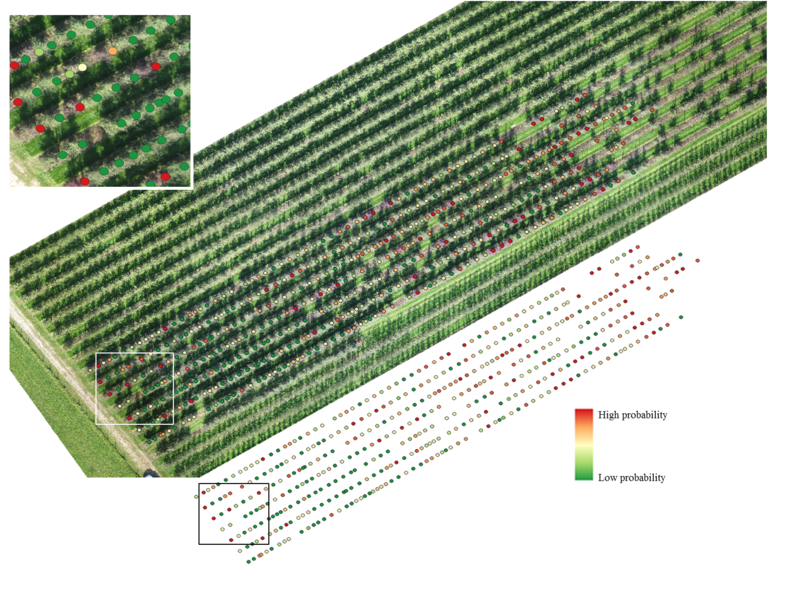 That is why VITO Remote Sensing assists these growers by providing critical information on orchard variability. Fire blight is a very tricky disease. It is the enemy of every pear grower because once plants have been infected with fire blight, you are no longer allowed to export their fruit. Fire blight is caused by a bacterium, Erwinia amylovora, which infects flowers, active growing shoots, leaves and immature fruits. Infected plant parts will first appear water soaked, next they will wilt and finally turn brownish to black. The most difficult thing about fire blight is that it is very hard to control or stop as it spreads very rapidly. The sooner you detect an infection, the better your chances to stop the disease from spreading further and possibly infecting your entire orchard. So it is important to detect the infection in a very early stage, even when you cannot see the infection with your eyes. If you can spot the infection during a visual inspection, you are already running behind and the disease is spreading. That is why we developed a system that can detect fire blight earlier, before the plant visually shows effects of the infection. We have been working together with PcFruit for many years know. Since 2014 we’ve been doing research to see if drones could be used to detect natural fire blight infection in a heavily infected pear orchard. Very promising results were obtained for the detection of internal fire blight infection. This type of infection is hard to see during the visual inspections, but it will result in early autumn coloration, which is easily detected with drones. Trees with internal fire blight infection often exhibit yellow to burgundy foliage about a month before onset of normal autumn coloration. However, this senescence can be observed even at an earlier stage through the monitoring of the chlorophyll content in the leaves. This enabled the detection of internal fire blight infections already in August.